The diagram above shows the steps that we will undertake, should you choose to be my coaching-client. The first step is a telephone conversation or an online questionaire, to determine your situation and prospects. This first exchange of ideas is of course free of charges, because it is mainly about assessing if I am really the best fit for you and your issue and if the 'chemistry' between us seems right. If you decide to work with me, I will use the first session to help you set a goal that you would like to accomplish through the coaching and to clarify the main 'bottleneck' you have to overcome to reach that goal. Together we then find the necessary methods and steps to take. 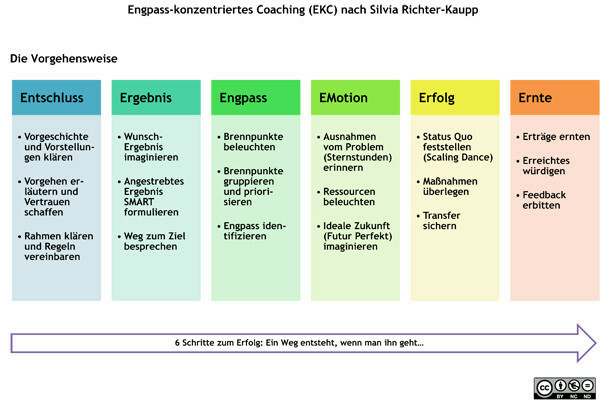 Individual coaching sessions usually take from half an hour to four hours and can either take place at my premises in Eisenlohrstr. 21 in Karlsruhe, at your company or on the phone (i.e. via Skype). Team and group coaching sessions usually last between three hours and a day and either take place at your company, a hotel or in my seminar room. Over the years I have come to appreciate the advantages of telephone coaching more and more: Coach and coachee are geographically independent and temporally flexible. Integrating coaching dates in your day is easier and all participants save time and money, because traveling times are eliminated. Many people find it easier to concentrate on the phone, because there are fewer distractions. The 'saving one's face' on the phone often leads to greater inner freedom and frankness and there is a great chance of gaining deep insights. If you are geographically located far away, you can asses my coaching-services as easily as someone from the region around Karlsruhe. I have never seen several of my clients because they live in a different part of Germany or even in another country. If you don't speak German, we can conduct the sessions in English. If you are interested in coaching, send me an email or leave me a message on my answering machine under +49 721 9374810.